On March 17, the gang from Greendale will move from the small screen to the even-smaller screen when Community’s preordained sixth season makes its digital-first debut on Yahoo. Perhaps someday, new episodes of the beloved-yet-battle-scarred situation comedy will air exclusively on the Apple Watch or those video screens they have in the backs of cabs now. 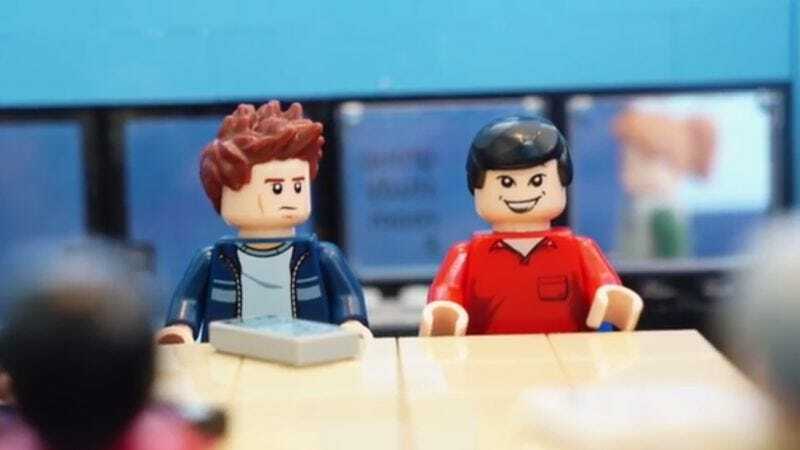 Meanwhile, fans of the series, which has been AWOL since April 2014, can remind themselves exactly what it was they enjoyed about Community by watching Eric Stevens’ meticulously rendered Lego tribute. Stevens, of course, is the auteur behind previous toy-block-based parodies of Seinfeld and Downton Abbey. Community, however, presented the artist with special challenges, such as conveying the proper ethnicity of the characters. “Unlike Downton and Seinfeld,” he told Popculturology, “the Community cast has some diversity.” While some repurposed superhero minifigs allowed the filmmaker to complete his cast, he admits that the stern, grouchy-looking Abed avatar is still not to his liking.